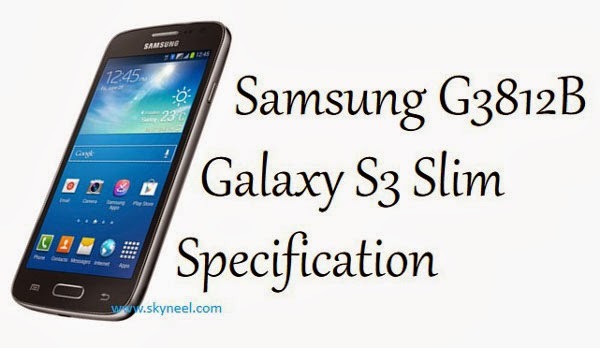 Samsung announced Samsung G3812B Galaxy S3 Slim phone at Estimated Price in India: Rs. 17000. Galaxy S3 slim run on Android OS v4.1.2 Jelly Bean, It’s powered by 1.2GHz Quad-Core processor along with 1GB RAM. Samsung G3812B Galaxy S3 Slim Powered by 1.2GHz Quad-Core processor. It has a powerful processor. It has Mediatek MT6591 chipset. It has 1GB RAM With 8GB ROM and user can be expanded memory up to 32GB via SD Card. Galaxy S3 Slim runs on 4.2 android Jelly Bean. The Smartphone has a compass, Accelerometer, proximity and Maps, Calendar, Google Search, Gmail, YouTube, Google Talk, Alarm, Calculator, Clock, and other Google sync apps. This is power pack with loaded lots of features and apps.